At MKids® we are passionate about junior golf and want to give young players the best possible start in the game by providing the best equipment to allow future stars to shine. Years of research has resulted in a range of clubs designed with player height, strength and swing speed in mind. The specification is progressive in every way, allowing for growth spurts of 4"/10cm, enabling the smallest starter to teenage golfers to play with confidence and reach their full potential. MKLite is designed specifically for players from 43"/110cm to 55"/140cm in height. Considerable care has been taken to design the clubs with the younger player in mind. Progressive length, shaft flex, grip thickness, head size, weight, and loft unite to make MKLite the perfect choice in terms of playability, forgiveness, and ultimately confidence. A unique Tour quality grip, created by MKids in a range of sizes that grow with the length of the clubs. Perfect to allow kids to develop a good golfing grip as they help to promote a light pressure grip while providing incredible stability. MKLite Irons are 90% of the size of adult clubs, and the head design with perimeter weighting and generous lofts all combine to make the perfectly flighted shot achievable by all young golfers. The Driver, Fairway and Hybrid have head sizes scaled with the length of the clubs creating optimum playability. 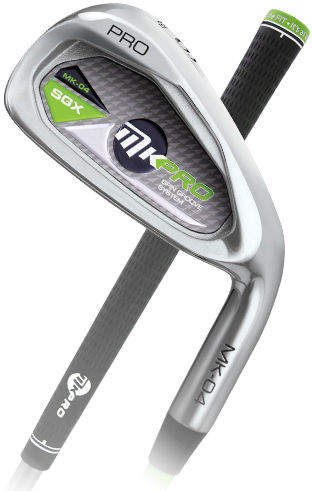 MKPro features progressive length, shaft flex, head size/weight, grip thickness, and loft. This combination makes MKPro great for the improving player who has more strength and control over their game. Grafalloy ProLaunch shafts, tour quality grips, perfectly sized and lofted woods and stainless steel ‘SGX’ - Spin Groove System Irons blend together to create the ultimate junior golf club. Designed specifically for players from 55"/130cm to 67"/170cm in height, with progressive length, shaft flex and grip thickness, makes MKPro the perfect choice in terms of playability, control and ultimately confidence. A unique Tour quality grip, created by MKids in a range of sizes that grow with the length of the clubs. Allows kids to develop a good golfing grip as they help to promote a light pressure grip while providing incredible stability. MKPro features a Driver of 360cc and Irons that are 95% of the size of adult clubs. The Iron head design with perimeter weighting and 2° less loft than MKLite Irons combine to bring all golfers optimum distance and ball flight. "We didn’t just revise, we re-examined, resized, and redesigned junior golf"